Definition: A person who moves from one place to another in order to find work or better living conditions. 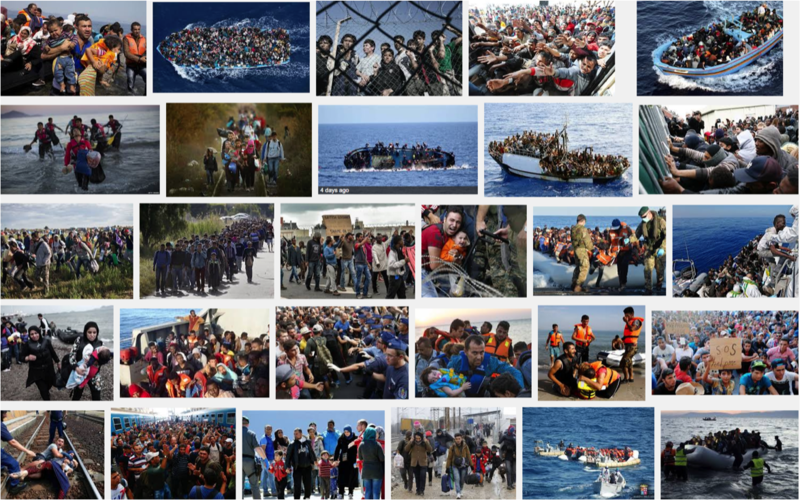 Most photographs of migrants for the UK show crowds of people massed on boats (in the Mediterranean or Aegan sea), traveling by foot or trying to get on trains (in Hungary). We are in the realm of photojournalism where images are employed in the news to depict the arrival of migrants in Europe. Serious things are happening in front of the viewer’s eyes but are difficult to interpret: is this an invasion? A humanitarian tragedy? An awakening call? A call for help? What reality do these images offer us? Is it a wholesome reality or does it direct us to certain aspects of it? Tragedy prevails with dramatic images of boats sinking, people being rescued, parents holding their children tightly, powerless people enduring a terrible fate. But sentiments of threat and fear are also communicated through photographs of protesters (in Calais and the UK), of migrants facing armed forces and pictures of individuals confusingly protected or trapped by the police. Some images show groups of people literally coming into the viewer’s direction or kept hopelessly at a distance in the middle of the sea. This collective narrative treats all migrants alike: they all seem to share the same past, destiny and future. This keeps the viewer personally and emotionally detached. Whilst close up images of parents with their children focus on an individual narrative that provokes both greater empathy and a more acute sense of tragedy. Migrants arrive on the shores of Europe, walk across Europe but so many questions remain unanswered in those pictures: Who are they? Where do they come from? What do they escape from? Where do they go? For how long will they have to travel? Where will they finally settle? Rather different images for migrants in Germany.